Have you ever seen the "Girl, you don't need makeup" sketch from Inside Amy Schumer? (Ok, hopefully you have now.) It's hilarious on many levels, but what resonates the most for me is the male belief that they don't like makeup...but then realize that women need, as the song says, "Just a little makeup, some natural-looking makeup." Which is exactly what I sing whenever my boyfriend tells me I don't need to put any on. I do, believe me. 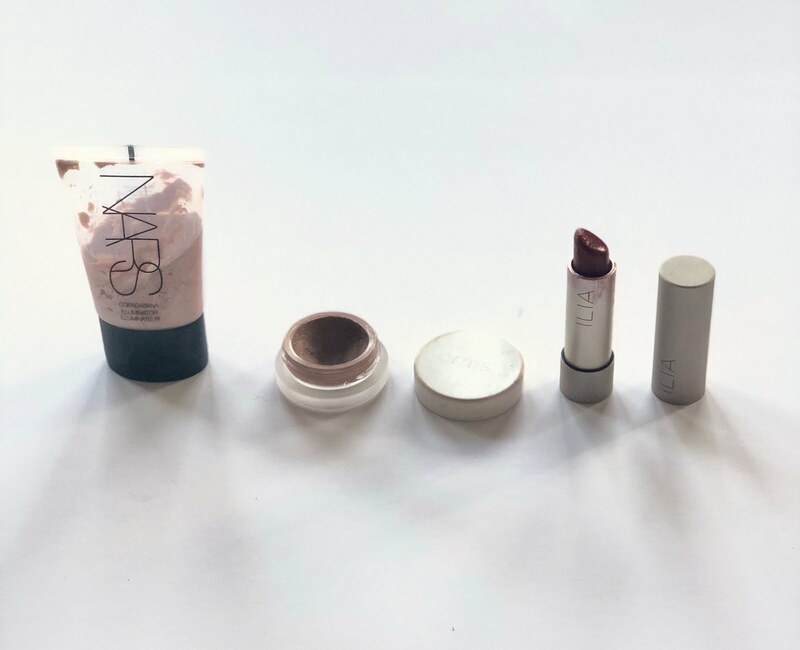 That said, I like to look as natural as possible—I personally feel my best this way, but I hold no judgment against anyone who prefers a more dramatic look—and I also like to use as many clean products as possible. Here's what my current routine looks like. 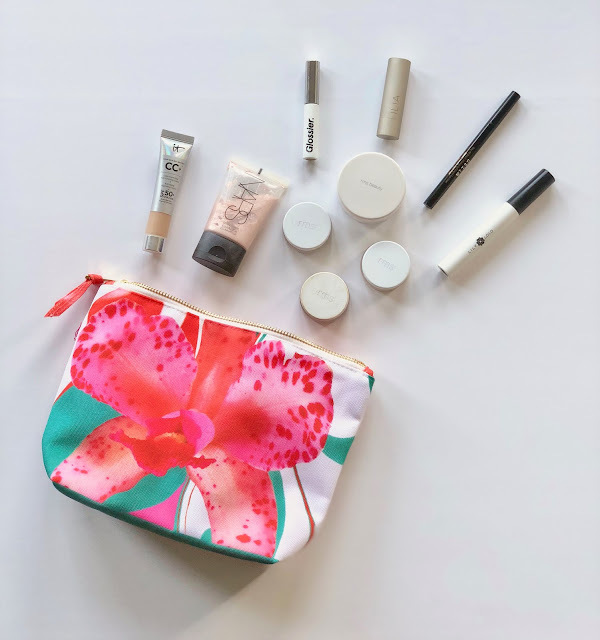 I am a huge fan of RMS Beauty, Rose-Marie Swift's clean makeup line; her Un-Cover-Up concealer is arguably better than my previous holy grail, YSL's Touche Eclat. I use it under my eyes and along the length of my nose, then I dust with Un-Powder, also by RMS, to set and control shine. 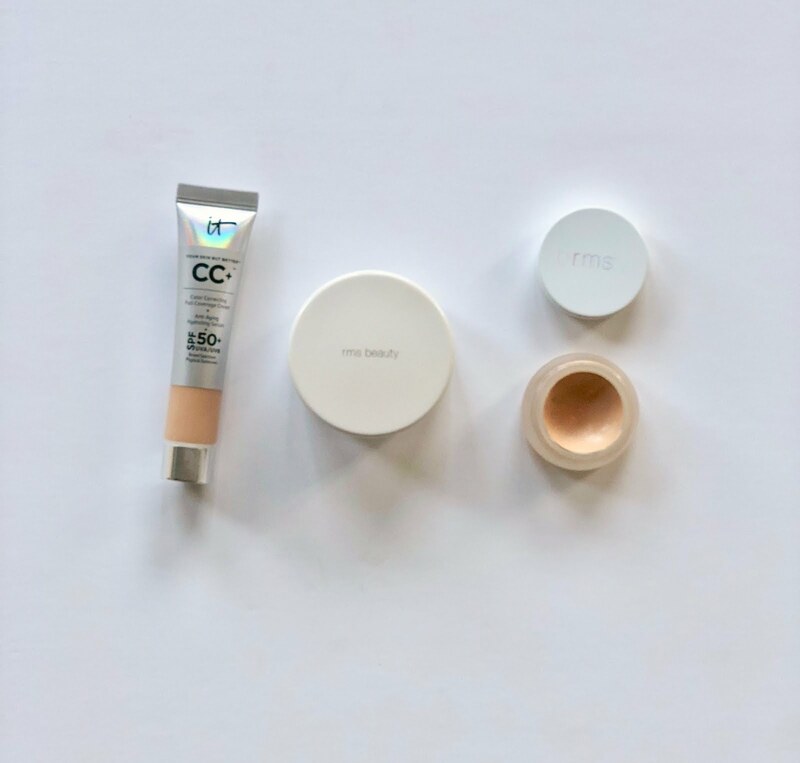 If I'm doing a photo shoot, before I use the powder, I also use IT Cosmetics CC cream where my pores and redness are the worst, along my T-zone and chin. 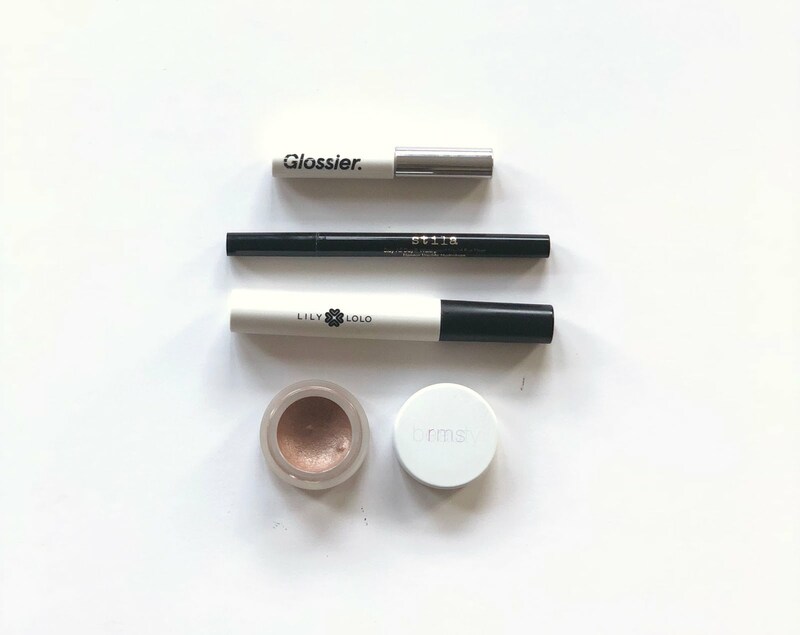 For eyes, I start with Glossier Boy Brow, which is just as good as everyone says it is. RMS Eye Polish in Myth goes on my lids, and I line with Stila Stay All Day eyeliner, which I know is not clean but is the best eyeliner in the world, so you can pry it out of my cold, dead hands. (I've heard Well People makes a good clean one, so I will try that when I can work up the courage.) I do use a clean mascara, by Lily Lolo, that gives better definition and volume than most conventional mascaras. On my cheekbones, I put Nars Illuminator in Copacabana. I will eventually switch to RMS Living Luminizer, but that could be years from now, because the Nars stuff lasts FOREVER. Since it's summer, I put a little RMS Buriti Bronzer on the apples of my cheeks; in the winter, I use Beautycounter Color Pinch in hibiscus. Finally, I finish with Ilia Tinted Lip Conditioner in Arabian Nights, which is much more sheer than it looks in the tube but pigmented enough to last for hours. I almost always wear clean lipstick—since you end up swallowing most of it, better safe than sorry! 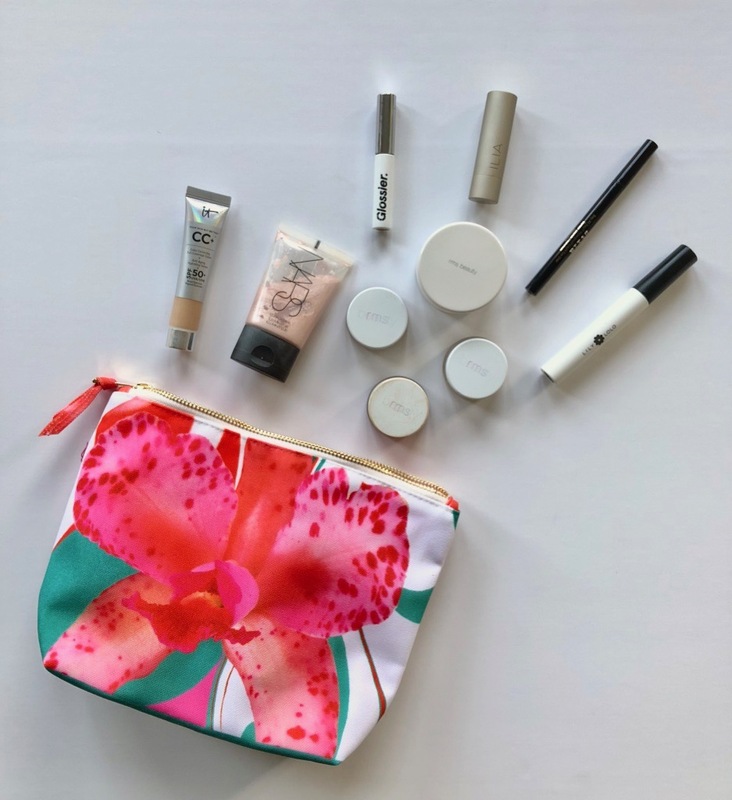 I love seeing what is in your make up bag! It's always interesting to see what type of products are out there. I don't use a lot of make up so finding a good eyeliner or say concealer are always a plus and normally, almost all that wears make up will use these two products. It's almost a mini review on these items I look at and its great! I love a natural look, especially in the summer. I would love to try that NARS product! hahaha I love the cute makeup bag!